A 86-year-old woman was struck and killed by a tow truck Oct. 25, 2011. This tow truck was parked between two police cars at the intersection where she was struck hours after the crash. MANHATTAN — An 86-year-old woman was fatally struck by a tow truck while crossing East 65th Street at Fifth Avenue Tuesday morning, police said. The woman, whose identity was not released, was lying on the ground with severe head trauma when police arrived at the scene around 9:30 a.m., the NYPD said. EMS workers transported her to Weill Cornell Medical Center, where she was pronounced dead, police added. 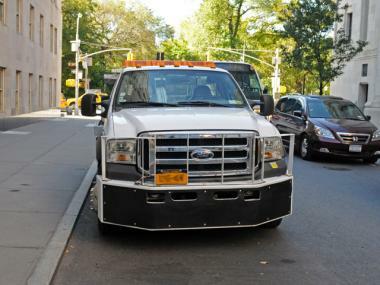 The 62-year-old driver of the 2007 Ford F450 tow truck was making a left turn on to East 65th Street from Fifth Avenue when he struck the woman, according the NYPD. He remained on the scene, police said. NYPD officials said an investigation is ongoing. 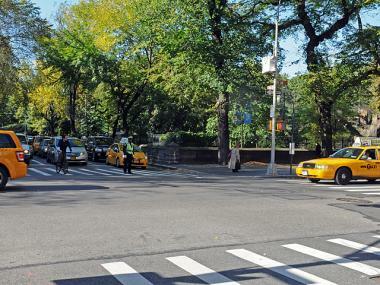 A 86-year-old woman was struck and killed by a tow truck at the intersection of Fifth Avenue and 65th Street on Oct. 25, 2011.